To raise awareness of the significance of Chief Tamanend, William Penn’s Treaty of Friendship and its principals of social justice, peace, liberty, freedom, and mutual respect, while connecting the history of our past to the events of present day, the Trail of Hope brings together universal truths among humankind. A 2,000 mile walk lasting for six months will begin on March 23, 2011. There will be no corporate sponsors and no cars following with supplies. Peter Prusinowski, a resident of Fishtown, will leave Penn Treaty Park at 9 a.m. to begin a solo journey. Under the shade of the Great Elm Tree, as leaves rustled gently in the breeze, the voices of two very different cultures could be heard sealing a unique Pact; a Pact whose spirit of Peace, Love and Friendship has endured from generation to generation. The Treaty between William Penn and Chief Tamanend, a “treaty never written, never broken,” serves as an inspiration to all mankind. Peace can conquer adversity, misunderstanding and disparity. No culture, creed, or background can deny the premise that we all are united by the same human spirit, that “we are of one flesh and one blood”. The Trail of Hope traces the Lenni Lenape Indian migration route from the East Coast to the Midwest and explores historical sites and events along the way. The Trail of Hope brings together the plight of Native Americans and the monumental events which helped to make the United States the nation it is today. The TRAIL of HOPE traces the Lenape Indian migration from the Delaware Valley all the way to Bartlesville, Oklahoma. Each step is a tribute; each location is part of a quest. The myriad of events which occurred during the past 400 years are connected to the occurrences of today and the social issues we encounter. As I take this Trail I will be reminded of the blood, sweat, and tears which once covered the very ground I walk upon along the way. This journey brings together the past and the present as an effort to inspire a more hopeful future. This trail is not only about Hope but about Unity as well. As a young boy growing up in Poland, there was a certain, unexplainable joy I felt running and laughing alongside my friends while playing soccer. It was as if the world stood in a state of perfect harmony, even if that was far from the truth. In high school I spent a great deal of my free time playing a variety of sports and chasing girls. I was also captivated by American Western movies. Actors such as John Wayne influenced my perceptions about not only America but the world as a whole, with values of honesty, loyalty, and bravery could be applied to all of humanity as well.And there was John Lennon whose music influenced and inspired so many. That’s what ignited my spirit of imagination and adventure deep within my soul. With a passion for life and a curiosity for the world around me, I packed up and moved to Paris. I found myself immersed with new and uncensored ideas about the world. This entirely new perspective caused me to crave exploration and discovery even more. Two years later my friend and I decided to go to America. As I said goodbye to my family and friends, I felt as if this move would be a permanent one. My friend and I landed in Philadelphia, Pennsylvania, a city which would forever change my life. The sun shone brightly on a gathering of Quakers and Lenni Lanape Indians as the waves from the Delaware River gently lapped the shore. 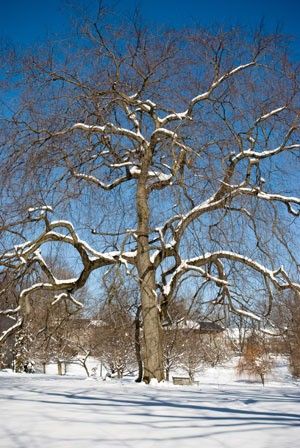 Under the tender shade of The Great Elm Tree, William Penn, an English Quaker and Tamanend, a Lenni Lanape Indian Chief, made a unique Pact which would forever change the course of history. The Great Elm Tree, once rooted in an area of present day Philadelphia formerly known as Shackamaxon, served as a symbol of strength, peace and friendship. The two leaders stood strong as one, like the Great Elm, on that fateful day in 1682. Known as “the treaty never written, never broken,” Penn’s Treaty of Amity and Friendship established a peaceful coexistence between two very different cultures. William Penn founded this Treaty on the Quaker principals of equality, integrity and peace. In return, Chief Tamanend bestowed a great gift upon Penn, sealing the pact with a Native American wampum belt. These two cultures formed a “chain of friendship,” that lasted for more than 70 years. 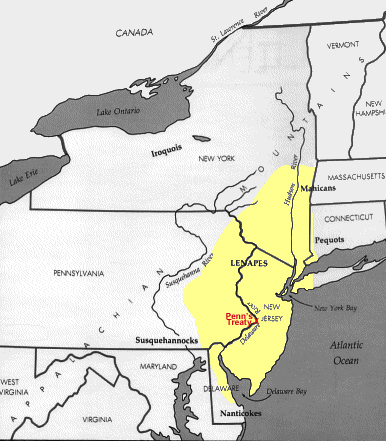 The Lenape Indians aka Delaware Indians lived in relatively permanent villages along the waterways in the Delaware Valley. They would travel in dug out canoes for trading furs or gathering supplies to aid farms. At first, white settlers and the Indians were able to cohabitate peacefully. From the Swedish, to the Dutch and eventually to English Quakers led by William Penn, peaceful coexistence was a common element among the Indians and the White man. They traded ideas, goods, and lived in the Delaware Valley as a community of different cultures. On the banks of the Delaware River, directly northeast of center city Philadelphia, Pennsylvania, you will find a small and vibrant community known as FISHTOWN. This unique and energetic neighborhood is full of history, arts and culture. It is also home to the monumental place where William Penn and the Lenni Lenape Indians made the Treaty of Amity and Friendship in 1682. Fishtown was originally known as Shackamaxon settlement. The first inhabitants of the area were Native Americans – Lenni Lenape, who farmed and fished on the agriculturally prosperous land. The Penn Treaty Museum, an online museum, celebrates the 1682 Treaty of Friendship made between Lenni-Lenape Chief Tamanend and William Penn under the branches of a majestic elm. Sealed by the presentation of a wampum belt, many people believe this simple act of friendship represents the best of our human spirit. The museum collection keeps the story of the Treaty Tree alive through poetry, art, written word, music and in relics made from the Treaty Tree and its offspring. The Museum commemorates the principles of fairness, peace and social justice that are symbolized by the Treaty Tree, a tree finally toppled on March 5, 1810 in a violent storm. The museum sponsors educational events open to the public to share the timeless story of the Treaty. Looking at Mother Nature one can easily notice that diverseness is precisely what provides the natural world not only with its magnificence and beauty, but additionally its capability and strength. Existence wouldn’t blossom if everything was virtually identical. Our emotions and thoughts are exactly what link us to our genuine truth and allow us to develop into much more conscious of what’s taking place within the facade. Yet, for most people, it’s complicated to be aware of or express our emotion because we’ve been accustomed to neglect or not recognize our inner thoughts. We all are so different and distinctive, with various interests, pursuits, as well as talents. We were created to convey and rejoice all of those diverse shades! As a culture, we’ve been squeezed into the status quo for way too long. Once we make it possible for ourselves to express ourselves legitimately, our vulnerability effortlessly attaches us with others. The bells rung loud and clear, as a group of love, peace and amity supporters celebrated Tammany Day, this first day of May, right here in Philadelphia. It’s been a long, long time since last May’s festivities, but thanks to the Old City Civic Association, once again Saint Tamanend , a symbol for native-born Americans, was recognized. Through generations Tamanend has been adored and highly regarded for his virtues of integrity, ethics, honor, value, justice, as well as equality for the common individual. The earliest May Day activities came out in pre-Christian times, along with the celebrations, get togethers, customs or other activities around that period. The actual day has been a traditional summer time festive in numerous pre-Christian European civilizations. February 1 was the very first day of Spring, May 1 was the very first day associated with summer season; therefore, the summer solstice about June 25 ended up being Midsummer. The term solstice originates from Latin sol – sun, and sistere – to stand still. May 1 is the 121st day of the year in the Gregorian calendar. There are 244 days left over till the conclusion of the year. The legacy of Penn Treaty Park is over 330 years old. And from the early years it was always a Sacred Ground. It took over 2 centuries to make it a public Park. Many individuals cherished and tended this place, committing their own believes and hopes on the importance of preservation. Finally, after years of efforts Penn Treaty Park was recognized and registered by Philadelphia Historical Commission. There endures just the basic oral custom concerning the actual Great Elm, and the certain recollections associated with an aged woman that stated to have got seen the actual event as a youthful young lady. The woman recalled it strongly not due to the fact she recognized at the time its historic importance: parleys with the Indians had been frequent situations on the frontier in those days. She remembered it clearly due to the fact Penn had been the handsomest person she had ever before experienced, prior to or even since. This woman furthermore informed of the special event following the actual agreement formalities concluded. The attractive Penn had been wondrous, his state of mind overflowing. He consumed the Indian meals with relish, and settled to learn their own language so he could communicate with his brand new friends personally. And then something remarkable occurred that created the night even more unforgettable to the young girl. The Indians started dancing in celebration, to jump as well as jump with the throb of the drums, and to whoop and chant their particular unusual sounds. towards the Spanish and Le Chemin de Saint Jacques is actually a 1,000-year old pathway from France to northern Spain. Millions of pilgrims stepped throughout the years. Some journey by foot, a few cycle bikes as well as some also by horse back. There are a number diverse tracks and beginnings of the trail. The actual walk leads to the town of Santiago de Compostela exactly where the remains of Saint James are laid to rest. 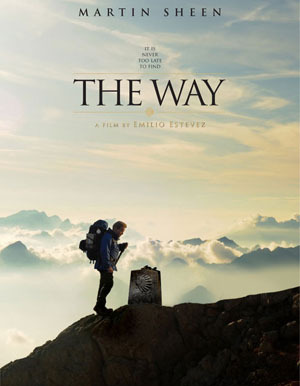 Backpackers walk the trail as a quest and a way of experiencing and uncovering personal life. There are a lot of unique causes for trekking the Camino de Santiago. Catholics tend to be hiking as a faith based pilgrimage, a journey of amazing christian importance adhering to in the actions of many other pilgrims. Some others tend to be walking for a spiritual magnitude, seeking to restore to discover or …..
Holding his dream in his heart, William Penn sighted the Delaware Bay in 1682 and arrived at Shackamaxon, where he was greeted by its inhabitants, Lenape Indians. It was here, next to the gently flowing waters of the Delaware River, and under the shade of Great Elm tree William Penn entered into the Great Treaty with Chief Tamanend. Those two leaders made a covenant of peace, love and friendship with one another. A powerful commitment witnessed before heaven and earth. It spoke of Faith and Unity, and it spoke of Hope. The 1st. anniversary of the 2000 MILE WALK on The Trail of Hope. 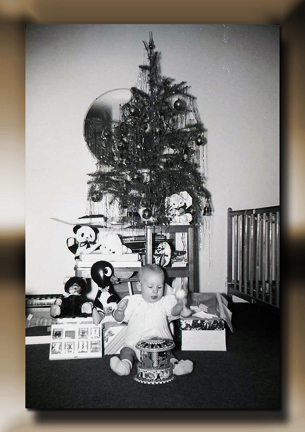 Wishing you a very Merry Christmas, Happy Holydays and a Wonderful New Year! Every day should be like it is a holiday, being thankful, grateful and spending time with family, and looking with Hope to the future surrounded by Love. May the true Spirit of the Season find you and fill your heart with health, joy, and abundance of happiness. We all have different paths in life, but no matter where we go the Spirit of the Holyday brings back the beautiful moments and happy memories wherever we are. To you and your family; Love, Peace and Amity this Holyday and always. Ever since I’ve returned to Philadelphia, I’ve been tying up lose ends and acclimating to life after the Trail of Hope. Things have been quite busy since my return. About a month ago I traveled back to Warsaw, Poland to visit my parents. I had a wonderful visit but my mind was captured by the reality of time. It was bittersweet to see my parents, succumbing to the inevitable power of old age. I was happy I could visit but sad I had to leave them when it was time to head back to America. On October 21st, I held a photo exhibit, entitled “Fruits of Solitude,” at the Penn Treaty Park Museum which featured photos I took on the Trail. I had a great time talking with visitors about my experience. 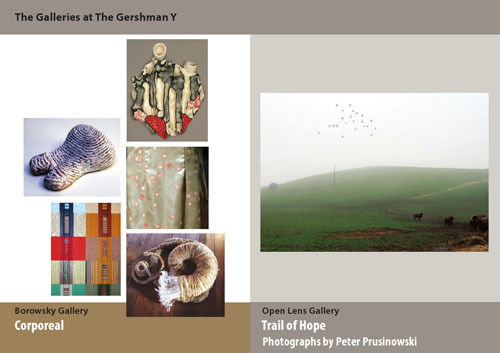 There will be another photography exhibit in early January. Hope to see many of you …. Visual Artists Self-Promotion – Inspiration – http://www.artfulwhiz.com – Change life, Dream Big! Words cannot convey my gratitude for all the beautiful people who came to my ” Fruits of Solitude” Photography Exhibition. Your attendance made it that much more of a celebration , celebration of Love, Peace and Amity. Great humor and lively conversations added to the occasion. I was honored to see so many “old” and new friends supporting my Photographic efforts. I am so grateful to all kind and generous that followed me along the Trail of Hope. Again, I give you my sincerest thanks. Edward S. Curtis (1868-1952) life long dedication , who gave his entire life and fortune to record on photographic film the memories of the last Native Nations of North America from the Apache, down in the South, to the Nunivak in Alaska. In 1906 J.P. Morgan offered Curtis $75,000 to produce a series on the North American Indian. It was to be in 20 volumes with 1,500 photographs. Morgan was to receive 25 sets and 500 original prints as his method of repayment. 222 complete sets were eventually published. Curtis made over 10,000 wax cylinder recordings of Indian language and music. He took over 40,000 photographic images from over 80 tribes. He recorded tribal lore and history, and he described traditional foods, housing, garments, recreation, ceremonies, and funeral customs. He wrote biographical sketches of tribal leaders, and his material, in most cases, is the only recorded history. It has been almost a full month since I completed the Trail of Hope. I am still having a difficult time adjusting. My mind keeps rewinding back to memories of walking and the Trail in general. Recently I worked on organizing all of the photographs I took along the way. It was wonderful revisiting the many different sites of the Trail. Since I have been back in Philadelphia, I’ve taken a few walks down to Penn Treaty Park. 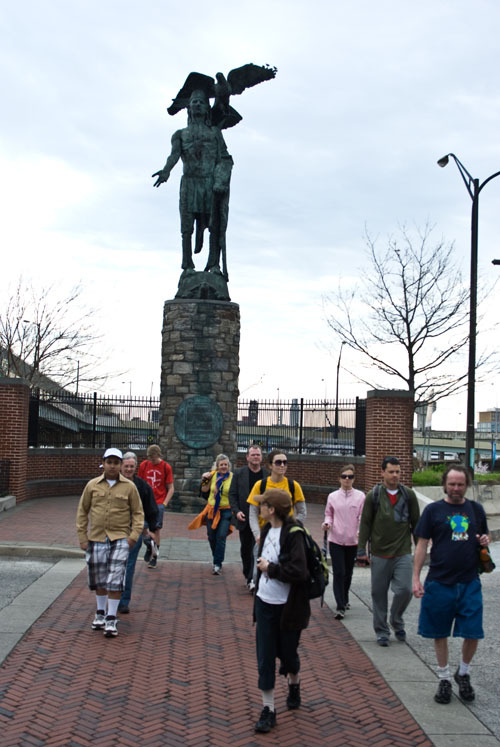 It was a great feeling to be able to walk on those grounds which helped build inspiration and origins for the Trail. It will always remain a very special park to me as well as generations of Fishtown residents who frequent the historic riverside area. Nothing is more intriguing to look at than another human being. Each face is a puzzle of individuality, revealing as much as it hides. its strength and its vulnerability. Photography exploits our fascination by enabling us to scrutinize without restraint. The principle of goodwill and friendship toward all men laid at the very root of William Penn beliefs. Yesterday I took the final steps of the Trail of Hope. I can’t believe it is finally finished! It has been long journey and I’m grateful that I was able to end it in such a special way. The night before last, I spent the evening at the Delaware Indian Pow-Wow grounds about 17 miles from Bartlesville. I was joined by the Assistant Delaware Chief Chet Brooks and Michael Adair. We left the grounds at midnight so we would arrive around noon in Bartlesville, Oklahoma. By 7am a big thunderstorm came into the area and showered rain down throughout the remainder of our walk. It doesn’t seem ironic that the first steps of the Trail of Hope were taken in the middle of a light drizzle and later, a steady rain. In my first post of the Trail, I stated that I felt like the rain was blessing the Trail ahead, washing away any danger, and helping me to feel safe that everything would turn out all right. Alas, the final steps of the Trail were also made during a rainstorm, blessing everything behind me and the paths I will take in the future. Turn, … Turn, … Turn … ! When you no longer go forward, … which path in life do you take ? - The one to the left, where nothing is right , or …. - The one to the right, where nothing is left ? For nearly 70 years as a performer, Pete Seeger has embodied the ideals of folk music – communication, entertainment, social comment, historical continuity, inclusiveness. The songs he has written, and those he has discovered and shared, have helped preserve our cultural heritage, imprinting adults and children with the sounds, traditions and values of our global past and present. Yesterday I crossed over into Kansas near Kansas City. As I approached closer and closer to the city, the traffic on the road I was walking on picked up quite a bit. Kansas City reminds me of many other cities, big, crowded and full of traffic. I was surrounded by cars as I continued to press onward through the heat. Today I am taking a nice rest. Over the next couple days, I’ll be in and around the Kansas City area. I will be going to Shawnee Mission, an area in Fairway, Kansas which served as a manual training school for children from the Shawnee, Delaware, and other Indian nations from 1839 until 1854.
p>Shawnee Indians, along with many other eastern tribes, including Delaware, were moved to present-day Kansas in the 1820s and 1830s. Upon relinquishing their lands in the East, Shawnees received a large tract of land (about 1.6 million acres) west of Missouri in an area sometimes called the Great American Desert. In July 1830 Chief Fish, leader of the Missouri Shawnees, requested a missionary through their Indian agent George Vashon. A missionary society was formed in September 1830. Reverend Thomas Johnson, a Methodist minister, was appointed missionary to the Shawnees and his brother William, missionary to the Kansa tribe. The Reverend Thomas Johnson was born in the Shenandoah Valley in Virginia and later moved to Missouri. He married Sarah Davis at Clarksville, Missouri, in 1830, and that same year he arrived with his new bride in present-day Turner, Wyandotte County, Kansas.